Histories of the Labour Party and tales of Labour heroes can perform a very specific function. They can ‘legitimise’ woolliness, lack of theory, class-collaboration and opportunism as a natural and beneficial product of British conditions and as being in line with the superiority of British institutions to those of other countries. The argument goes that the British Labour Party arose from advantages unique to Britain, advantages not in the possession of ‘lesser breeds without the law’. He also informs us that: ‘Keir Hardie and the delegates to the conference showed their practical wisdom and their understanding of the British political character.’ Here is his flowery description of that ‘British political character’. It translates into - two words - political opportunism. narrowly defined practical programme, but leaves instead sufficient freedom for the interpretation of events and needs and the common sense application of fundamental philosophies according to the circumstances of the time. Here, of course, we are in the presence of one of the most widely spread of myths: that Marxism is something alien to the inimitable development of Britain. Today, it is true, there exist leaders of the Labour Party who will tell us that Marxism has made a ‘contribution’. They are even prepared, like Wedgwood Benn, to name Marxism as one of the factors going to make up the Party. Michael Foot himself, has recently been found (Observer January 10, 1982) to praise not only the contribution of Marx to socialism, but also of Trotsky — while, naturally, declaring himself against any of today’s Trotskyists. But this type of acknowledgement of Marxism is grafted onto the doctrine of British exceptionalism. The importance of our movement is our Britishness and the labour movement has developed trying to resolve the problems of our nation. Mr Morgan Phillips, when he was General Secretary of the Labour Party, once said that the Labour Party owed more to Methodism than Marxism. Mr G.D.H. Cole in A Short History of the British Working Class Movement told us that the Independent Labour Party was the ‘soul’ of the movement which brought about the Labour Party while the Fabian Society was its ‘brain’. The ILP he described as ‘humanitarian radicalism adopting a socialist policy as the means to a more equable distribution of wealth and happiness’. Francis Williams, Morgan Phillips, G.D.H. Cole and Wedgwood Benn — who directs us to look at the Bible as being part of the coalition of forces on which the Labour Party is built — this brigade sounds off from right to left about the practical Christianity, Fabian evolutionism or woolly ILP radicalism combining to form the Labour Party. We have to admit that, in one sense, they are absolutely correct. It is these ideas plus much more of what, from the point of view of socialism, can only be called backwardness, which have formed the official ideology, the ideology of Labour Party leaders. When they tell us that this ‘coalition of forces’ is the strength of the Labour Party as an instrument for socialism they are talking absolute and anti-working class nonsense. In fact, they are saying that opportunism is the prime strength of the British movement and thus giving to themselves the right to continue as opportunists. The real history of the Labour Party and the lessons from it are vital for workers today. For we with our fathers and grandfathers have paid a price for the Christian Socialism, woolly pacifism, wordy radicalism and Fabian reformism which came into the Labour Party from the capitalist class, and dominated it. History as told has been stood on its head. In reality, it is not Marxism that came into the labour movement out of line with the development of the major historical force in Britain — the working class. Those who uphold Britishism as against Marxism cover the truth — that Marx and Engels and the group around Engels in the 1880s and 1890s, played a central role in the breaking of the working class from the capitalist parties. Those who fought consciously for an independent working class political movement in the latter half of the nineteenth century were Marx and Engels and the men and women influenced by them. The Marxists represented the essence of the movement of the British workers; it was the opportunists, the various brands of bourgeois radicals who grafted themselves on to it. No historian who does not study the development of Marxism as a theory and as a movement in the 19th century can understand the development of the British working class or indeed that of the world working class. We are saying here not only that Marxism provides a method of analysing developments; but that Marxism, in this period developed its basic principles in close association with the working class movement and through practical intervention in it. To look at the last half of the 19th century in particular, and fail to see it, so to speak through the eyes of Marx and Engels, is to see only an inexplicable collection of events. It is incontrovertible that only Marx and Engels foretold the major developments in the working class and only Marx and Engels prepared for them. Their strength was that they saw the decline of capitalism inside its greatest expansion. They saw the centralisation and concentration of capital in the middle of the greatest apparent strength of Free Trade, competition and laissez faire. And, above all, after the collapse of Chartism they envisaged and fought for the rise of working class political independence. They represented ‘the future in the present’. This came out of their understanding of the fundamentals of capitalism and of the laws of history. And any explanation of the development of the working class in this period has validity in proportion to what it owes to Marx and Engels. It was on February 27, 1900 that a conference in the Memorial Hall, Farringdon St., London, set up the Labour Representative Committee. This step towards a mass party of the British working class was taken 60 years after this class set up its first mass party — the National Charter Association. Not that the traditions of Chartism were raised at the conference, and certainly most of those present would know very little about them. National Charter Association and Labour Party were formed under decidedly different circumstances. The first came into being when British capitalism was in its youth. When the latter was formed, capitalism had begun its decline as a system. In that 60 years capitalism and working class consciousness had gone through great changes. Chartism was the widespread movement of a working class which was being brutally forged by the rapid growth of capitalist manufacture. When Chartism took on the character of an independent working class movement in the 1830s, the working class had already been through three decades of spontaneous outbursts and brutal isolated struggles, including an agricultural revolt. It had passed through the bitter experience of betrayal by bourgeois reformers. The industrial capitalists had united with the working class in a campaign for an extension of parliamentary suffrage. But when they achieved the Reform Act of 1832 which extended the vote among property owners they deserted their former allies. They used their new parliamentary strength to bring into being a Poor Law which set up the hated workhouses, which the poor called Bastilles, and legislated the persecution of the poor which was to drive ruined artisans and the agricultural dispossessed, into the factories. ‘The demands of the Charter’(1) ‘wrote Engels in Condition of the Working Class in England in 1844, ‘harmless as they seem are sufficient to overthrow the whole English Constitution, Queen and Lords included.’ Inform the Chartist movement was a movement for political reform; in reality it was a class movement against capitalism. Chartism collapsed at the end of the 1840s. Its last big rally was in 1848 on London’s Kennington Common. It was the year of European revolutions. The Chartists were in sympathy with the struggle against absolutism in other countries. When the Kennington rally took place the Duke of Wellington, instructed by the Cabinet, prepared as if for a revolutionary uprising in London. Among other measures, no less than 170,000 special constables were enrolled. After the demonstration, hundreds of Chartists were arrested, imprisoned and transported. But it was the development of British capitalism which undermined Chartism. From the end of the 1840s to the depression of the middle of the 1870s was the ‘Golden Age’ of British capitalism. Its products moved freely throughout the world unequalled by those of any other nation. Engels wrote at that time that British capitalism was like an ‘industrial sun’ with all other countries as markets for her manufactured goods, supplying her in return with raw materials and food and revolving round her. At this time the British bourgeoisie were moving into complete political as well as economic dominance in Britain itself. Their representatives and the state began that long experience of using sections of the working class or their leaders in order to rule. The organisations of the working class completely changed their nature from those in Chartist times. The old volatile organisations of struggle had gone. They had been intensely political. In their place came the ‘New Model Unions’ embracing a minority of workers. They were organised to protect the skilled workers through the control of the supply of labour and with a major purpose, the payment of benefits. They protected their trade with apprenticeship regulations, entrance requirements and high contributions. They were prepared to strike but the strike was solely a weapon of bargaining. Their motto was ‘Defence not Defiance’. The leaders of these organisations had not the least desire to return to the type of struggles of the Chartist period. On the contrary, they were repelled by them and many of them were thoroughly imbued with the ideas of expanding capitalism, that a man could rise with ‘self help’. Political assistance to their organisations they sought through an alliance with representatives of the ruling class, in particular the Liberals, although in the 1860s they were compelled because of legal chains on unions to bring them into political struggle for the vote. Bourgeois economists saw the capitalist expansion as unlimited and bourgeois leaders expressed overweening confidence in the capitalist system. Marx and Engels foresaw not only the recurring crises of overproduction but also the decay of the system itself, its gravediggers being the proletariat which must inevitably exert its independence. Great economic developments eventually forced forward independent politics among the working class. But it is not a question of the prescience of Marx and Engels. They had based their practical activity on this and intervened to assist it. Marxism was thus part of that movement that brought that conference in 1900, long before it took place. One is really driven to believe that the English proletarian movement in its old traditional Chartist form, must perish completely before it can develop itself in a new form capable of life. And yet one cannot foresee what this new form will look like. The Council was linked with trade union branches and the London Trades Council. During this latter half of the 1860s it was a ‘mighty engine’ as Marx called it, with its roots in the British labour movement. Even the conservative union leaders were being compelled to demand legal rights for their orgarnsations. (4) The demand for Parliamentary reform began to take hold again. For these new trade unionists, however, it had not the same content as the demands had for the Chartists — a change of system. But it was a move to independent working class action and Marx and Engels were there in the centre of it. The National Reform League, which had been formed by Chartist Bronterre O’Brien, in 1849 affiliated to the International Workingmen’s Association, and brought in a number of working class leaders who were socialists. Marx played the major part in levering into action the campaign of agitation and massive working class demonstrations that resulted in an extension of the franchise in 1867. The Reform Act gave the vote to the majority of working class males in the towns. Three weeks before he had told Engels. The workers’ demonstrations in London, which are marvellous compared with anything we have seen in England since 1849, are purely the work of the ‘International”(5) Mr Lucraft, for instance, the leader of Trafalgar Square, is one of our Council. This shows the difference between working behind the scenes and disappearing in public and the Democrats’ way of making oneself important in public and doing nothing. The emphasis is that of Marx. Marx refers again in another letter — to Kugelmann — to his keeping ‘behind the scenes’. He was not imposing dogmas on the labour movement but working through the reality of its own contradictions to set going independent class action. The movement fell back in the 1870s. The trade union went to their limits, of safeguarding their organisations under the present system. They achieved a greater degree of legal protection in the early 1870s. They were repelled by the Paris Commune. After the Reform Act of 1867, the Reform League faded. The next movement to independent politics was at the end of the century. It is significant that a part in preparing that movement was played by the campaign for the legal eight hour day, the very demand which Marx and Engels saw in the middle of the century as central to the development of the working class! The demand for the legal eight hour day was a demand of the international working dass. The chapter on ‘The Working Day’ in Volume 1 of Marx’s Capital (which was published in 1867) brings out the importance of this demand. A reading of this chapter will show how it was rooted historically in the consciousness of Britain’s oppressed. Marx relates that from the fourteenth century, that is from around the time of the Black Death, until well into the middle of the eighteenth century, the Labour Statutes in England were designed to increase the working day compulsorily. The establishment of a normal working day is the outcome of centuries of struggle between capitalist and workers. Centuries must pass ere the ‘free’ worker under stress of the developed method of capitalist production voluntarily agrees (i.e. is compelled by social conditions) to sell the whole of his active life, his very capacity for labour, his birthright for a mess of pottage. Hours of work, particularly among the mass of unorganised and unskilled workers, remained a burning issue throughout the century. The majority of skilled men had gained the sixty-hour week by 1860 and the fifty-four hour week by the early ‘seventies (though it was not always retained), but the working day for tramwaymen was sixteen hours or more, for railwaymen from sixteen to twenty hours; bakers, chemical workers and gas-stokers worked twelve hour shifts and sometimes more. Among unionists Scottish miners still worked twelve hours; in other mining districts all but the privileged aristocracy, the hewers (whose representatives in Parliament voted against the Miners’ Eight Hour Bill in 1888) worked anything up to eleven hours. Shop assistants under eighteen were granted a seventy-four hour week by the Shop Hours Regulation Act of 1887, which, for lack of inspectors, was never operated. The unpaid overtime of clerical workers, the limitless hours in the sweated home industries (clothing, furnishing, etc) will never be computed. Thus Dona Torr in Tom Mann and his Times describes hours worked in the mid-1880s when Tom Mann, at that time a follower of Marx and Engels, wrote his popular pamphlet on ‘What a Compulsory Eight Hour Working Day means to the workers’. At the same lime the Geneva Congress of the First International had called for the eight hour day,(8) and said that without it, ‘all further attempts at improvement or emancipation must prove abortive’. In the 1870s, an old member of the First International and personal friend of Karl Marx — Adam Weiler — continually raised the question at the Trades Union Congress (which came together first in 1868). In 1878 he read a paper to the Bristol Congress advocating legislation to limit the hours of labour. A vote in favour was carried in 1883 but no action followed. This fight for the eight hour day was an intensely political fight against all the conservatism and sectionalism, all the bourgeois ideology in the trade unions. The compulsory eight hour day was a question which posed the uniting of the whole of the class as a political force against the ruling class. As such it was hotly and stubbornly resisted by the leaders of the trade unions. They refused to make the hours of work a political issue. They and their supporters among the skilled rank and file argued that the issue should be settled by sectional strength and bargaining. The mass of workers who were unorganised and not able to bargain with their skill, did not concern them. They would use the Liberal arguments about free relationships between workers and employers without interference. But just as great economic forces were at work in the 1 840s which broke up Chartism, so the whole economic base of the ‘New Model’ unionism was being undermined. The monopoly of British capitalism was broken up and the ‘new forms’ which Marx and Engels foretold began to emerge. Capitalism developed in Europe and America. Free competition was giving way to monopoly; free trade and laissez faire to state assistance and to imperialism. The great overproduction crisis of the seventies spurred forward the epoch of imperialism. Capitalist rulers in a number of countries began dividing up the world for raw materials, areas of investment, spheres of influence. To be sure Britain developed for another few decades as the foremost imperialist nation. By the end of the century it had annexed a third of the world. But it was a system in decline, protecting itself against the very productive forces it was its historical task to introduce. The force which capitalism created, the working class, began to move again towards its independence. The truth is this: during the period of England’s industrial monopoly the English working class have to a certain extent shared in the benefits of the monopoly. These benefits were very unequally parcelled out among them; the privileged minority pocketed most. But even the great mass had a temporary share now and then. And that is the reason why since the dying out of Owenism there has been no Socialism in England. With the breakdown of that monopoly the English working class will lose that privileged position; it will find itself generally — the privileged and leading minority not excepted — on a level with its fellow workers abroad. And that is the reason why there will be Socialism again in England. It was the most exploited sections which headed the new awakening of the British working class. Their movement began in the East End of London and spread rapidly throughout the country. In 1888 six hundred match girls at Bryant and Mays struck against intolerable conditions and with widespread support won concessions after a fortnight’s strike. In 1889, 800 gasworkers in East Ham formed a union with a single aim of demanding an eight hour day. Within a fortnight, there were 3,000 members. By June it had been registered as The National Union of Gas Workers and General Labourers of Great Britain and Ireland. (It became the main body forming the General and Municipal Workers Union.) By the end of July it had 20,000 members and it had begun to spread throughout the country. In the next year it reached 100,000. Will Thorne, a member of the SDF, and who was taught to read and write by Eleanor Marx, became General Secretary. In August 1889, dock labourers in South-West India dock went on strike for sixpence and hour, the abolition of sub-contract and piece work, extra pay for overtime and a minimum engagement of four hours. So began the famous strike for the dockers’ tanner. Within three days ten thousand dockers were out, joined by the Stevedores’ Unions. In a week practically all the riverside workers had joined the strike. By this time the 30,000 dockers on strike comprised less than half of the men out. Massive demonstrations and rallies were held during the strike. It had widespread support among the working class. In total £30,000 was remitted by telegraph to the Strike Committee from Australia. The Chartists who had been transported or emigrated there were taking their revenge. We shall return to Mr Hyndman when we deal with the role of radicalism in the formation of the Labour Party. Out of the ferment of this time a mass party was posed. At the end of 1892 a ‘unity’ conference was held at Bradford. Out of this came the Independent Labour Party. But before we deal with this conference we must discuss the Fabian Society and the Social Democratic Federation. 2. The International Workingmen’s Association was formed from a meeting of London trade unionists called in support of workers in Poland. 3 . As one example — Minutes of General Council meeting of October 9, 1866 record a deputation from the ‘Hairdressers’ Early Closing Association’. They read: ‘The deputation stated that their trade was engaged in struggle for early dosing on Saturday afternoons. Several middle sized employers were bringing over men from Pans to fill the places of those me who had been called out of the recalcitrant shops. The deputation prayed the Council use its influence at Paris to frustrate the evil designs of these masters. 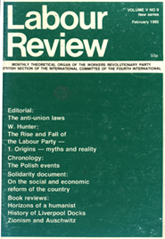 Carter, Marx and Lawrence spoke in response, pleading the Council to use its best efforts in the direction mentioned.’ The Documents of the First International Vol II. 4. Between the repeal of the Combination Acts in 1825 and the trade union legislation of 1871 -5 the existence of trade unions had been allowed, but practically everything they did could be declared illegal under the laws covering conspiracy, contracts etc., and as the unions became more powerful these old laws were increasingly used against them.’ Tom Mann and his Times Dona Torr. 5. The power of the International is shown in that at one time Cobden (the leader, with Bright, of the radical wing of the industrial bourgeoisie) approached the General Council to bring the working class behind them in a campaign for universal suffrage. They have ‘arrived at the realisation that they are incapable of setting the ball agoing’ wrote Man to Engels. In this letter dated February 1st 1865, he outlines the tactics worked out by himself and agreed by the General Council. 6. The picture of the terrible, brutalising and physically destroying hours that were worked at this time is best brought out by the example that Marx gives of an engine drivers hours. The extract assumes added importance as showing the roots of enginednvers stubborness in protecting their hours today. Marx quotes Reynolds Newspaper for January 1866. ‘Week after week’, he writes, ‘iii this same paper under the sensational headings of ‘fearful and fatal accidents’, ‘appalling tragedies’, etc., we read a long list of fresh railway catastrophes. Concerning these a railwayman working on the North Staffordshire line comments: “Everyone knows the consequences that may occur if the driver and firemen of a locomotive engine are not continually on the look-out. How can that be expected from a man who has been at such work for 29 or 30 hours, exposed to the weather and without rest.” He then gives a week’s shifts starting at various times and which ammounted to 88 hours and 40 minutes. 8. The proposal which was carried was put to the Congress by the General Council and declared that ‘a limitation of the working day is a preliminary condition without which all further attempts at improvement or emancipation must prove abortive. . . The Congress proposes eight hours as the legal limit of the working day’. 10. The American workers had inaugurated May Day to demand eight hours of work in 1886. 11. Marx and Engels on Britain. 12. Thorns made the point: ‘It was this spirit of the “New Unionism” that made international working class solidarity a reality, and strange to say the historians hardly notice the revolution we created.’ Quoted in Eleanor Marx by Yvonne Kapp.